No powder measure, regardless of price, has all the features of the Lee Deluxe Powder Measure. 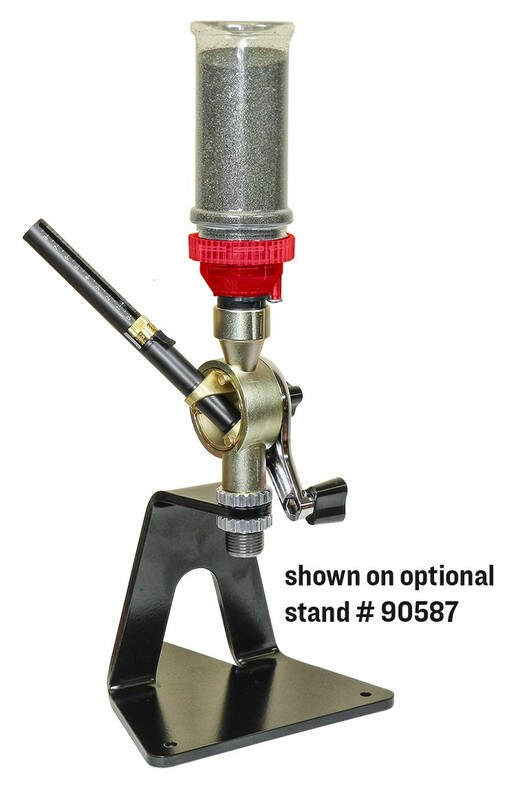 Pictured mounted to Powder Measure Stand product # 90587, may also be mounted to any reloading press accepting 7/8-14 threads. This powder measure features a high pressure die cast diamond-machined body. The precision-machined rotor drum is cast from brass, which is naturally anti-static and spark proof. A soft elastomer wiper strikes off the metering chamber rather than cut the powder. You’ll be surprised at how smoothly the rotor operates. More importantly, you will enjoy the most uniform of charges. Powder charge adjustment is accomplished with a true micrometer adjustable metering chamber. The metering chamber is aluminum with a black anodized finish. Features a crisp, permanent, laser engraved scale. The brass micrometer thimble is engraved with .01cc graduations and has a releasable detent lock. With most rifle powders each click is about a 1/10 of a grain, perfect for working up a load. Features easily removable hopper with an on/off valve so you can quickly return unused powder to its original container or switch to another type. The hopper feeds to a pre-measuring chamber allowing precise charges regardless of the powder level in the hopper, eliminates the need for an extra powder baffle. One of the nicest features is the ability to use the new Lee standard quick-change drums # 90453. These low cost drums can be preset to your favorite charge and swapped out in seconds. Excellent choice for the poor man's reloading bench. Lee perfect powder measure review. Click the button below to add the Lee 90699 * Deluxe Perfect Powder Measure * NEW! For 2017 to your wish list.